The Digital Innovations, Inc. Job Applicant System (JAS) was created in response to a customer request. They were looking for a simpler, lower-cost solution than they were previously using. The JAS allows the system administrator to enter job descriptions, etc. using an easy-to-use web interface. Jobs are instantly posted on the public side of the JAS. 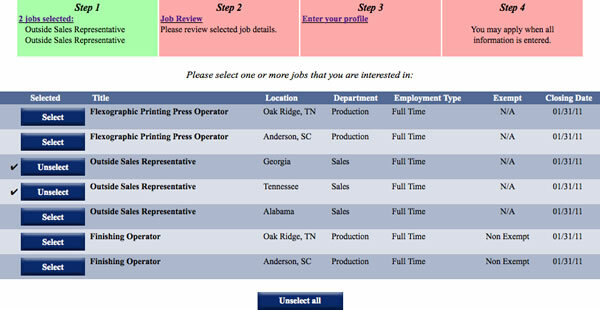 A potential applicant can see the list of jobs available. They would then select one or more jobs they are interested in. Once reviewing the job details, they would then enter their contact information. They can also upload a resume for more details. When an applicant applies for a job, all of the applicant details (personal information, resume, and job(s) applied for are both archived and also emailed to the appropriate people. For more information on the job applicant system, please contact us.